DC Comics, 2015 - brož., 199 str. What with working full time as a psychiatrist, managing an apartment building full of needy tenants and rambunctious pets, skating in the roller derby and trying to start up a new romance, Harley Quinn has precious little time left over for her mission of do-gooding. Time to expand her operation with her very own team of assistants! But only the best can trusted to spread Harley´s values of honor, trustworthiness and insubordination. The hiring process will be competitive... and bloody! And that´s not all! In this volume, Harley also breaks into Arkham Asylum to save her bestie Poison Ivy, falls hard for dashing millionaire Bruce Wayne and spreads her own unique brand of holiday cheer. 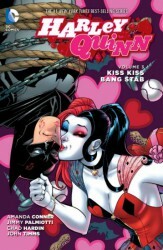 Everyone´s favorite nutbucket continues her big-city adventures in HARLEY QUINN VOLUME 3: KISS KISS BANG STAB, from celebrated writers Amanda Conner and Jimmy Palmiotti, and artists Chad Hardin and John Timms, with guest artists Ben Caldwell, Mauricet, Darwyn Cooke, Brandt Peters and more. Collects issues #14-16 of the ongoing series as well as ANNUAL #1, HOLIDAY SPECIAL #1, and VALENTINE´S DAY SPECIAL #1.